I love these ladies and their hearts. All of them are precious women that I either know in real life, or would someday love to know in real life. They make special things, and I can promise that you'll love everything you ever purchase from them. I'm doing this as ONE giveaway, though there are several components. I wanted to break down all the separate adorable items you'll be getting in the mail if you win! My friend Megan from Shop Nestled, makes jewelry that stuns. I own several of her pieces including a statement necklace, bracelet and cocktail ring, and they are some of my favorite things! She is giving away a pair of the cutest teal green rhinestone studs (Oh I wanted to keep those so much!) and a teal green cocktail ring. 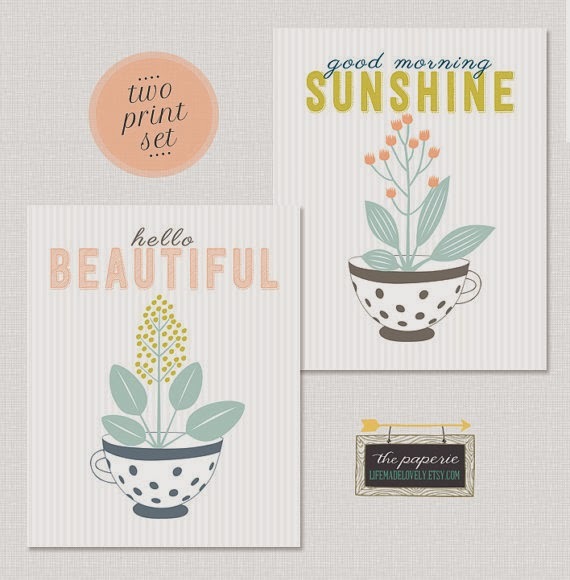 She is also offering 10% off any order right now, with the coupon code "LEMONADE10"
My friend Amber from Half Pints Prints, (who is also a sponsor of this blog) makes prints and invitations and takes custom orders. 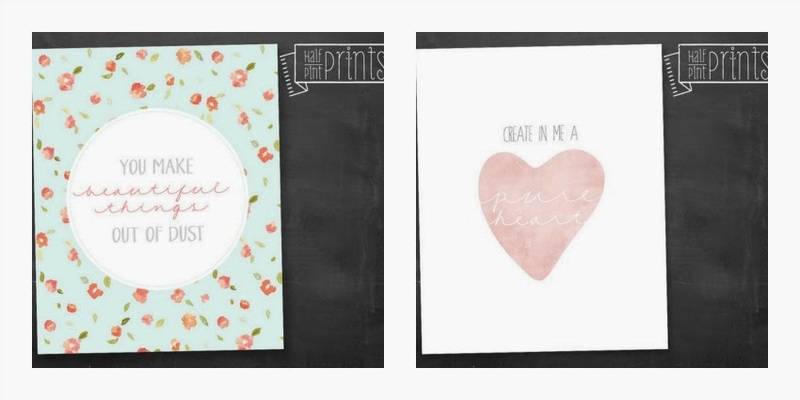 She is giving away these two Valentine- themed prints. They are the sweetest!! She is also offering a 20% discount code good toward anything in her shop by using the code "LOVEANDLEMONADE"
My friend Becky from Farmgirl Paints, makes leather cuffs and now sells her artwork too! She is giving away a sweet cuff that will practically go with anything you wear, and says, "be love." She is also offering a coupon code toward her shop for you guys. Use "LMM15" for 15% off. She opens her shop on Feb 3 and will only remain open for orders until the 7th, so be sure and place your orders according to that schedule. Her cuffs make wonderful gifts. 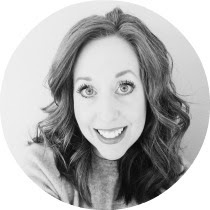 My friend Heather from Life Made Lovely, makes printables, prints, and designs blog layouts that make you drool. She is giving away this set of prints (above). (My favorite from her shop is probably the "Be still and know" print. It hangs in my office/ guest room.) She is also offering 20% off your purchase by using the code "LOVELY20"
Okay, so I'm waiting for the exterminator to find the dead animal that is stinking up my home, presumably under my house as I type this, so I've got to go... How's that for a closing?? 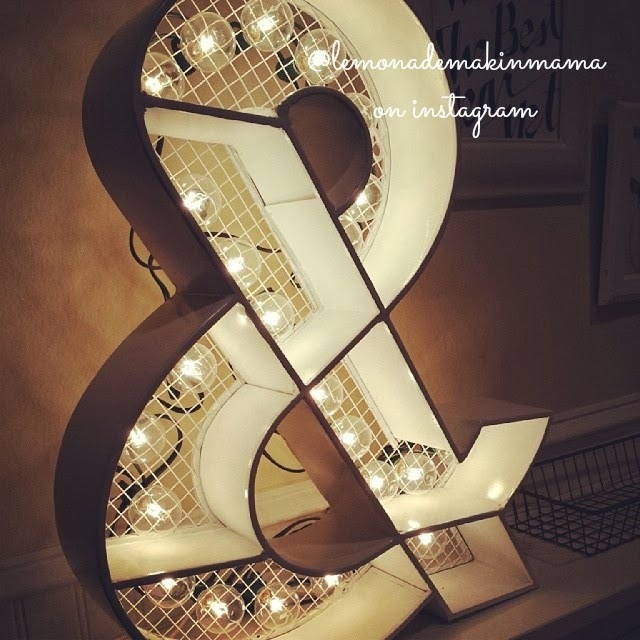 I've been keeping ya posted on that if you follow my Instagrams (@lemonademakinmama). However... I will announce the winner Wednesday when I reopen my shop and host "My favorite things" giveaway. In order to enter today's giveaway, please leave a comment of encouragement for these precious ladies and the beautiful things they create. You may also tweet, pin, instagram, blog, or facebook this giveaway for extra entries, just leave a separate comment for each of those. Now cross your fingers the exterminator finds the dead animal!! I'm freezing with all my windows open right now. Lately time is whizzing past. My kids are chasing me with their ever-increasing height, the school year is half over, birthday season is roaring toward me and my shop is nearly open which means my days have been a blur. With so many full, carefully planned days, long lists of things to get crossed off before collapsing into bed at night... I've got to confess something. I've been briefly glancing at the Lord's table.. not stopping long enough to sit down... and just grabbing a vitamin's worth of Him lately. Vitamins... they are good. They are full of good things you need, but you can't exist on them for long. They won't sustain you when the hunger pains hit, you know? This occurred to me the other morning as I rushed through my devotional, and took my "vitamin route" rather than sitting and savoring a meal of His word, that I was spiritually starving myself. Yesterday, I felt broken by this realization because when you've got a full plate of activity and chaos and kiddos melting down facing you, the best thing you can do for yourself is stop, settle your heart, and bask in Him for a while. I know this of course. I really do. I mean, it makes the entire day smooth out before your feet and you remember how to breathe through any of the crazy moments that will certainly come your way. So how did I forget this truth that I knew? Jeremiah 29:12-14 "Then you will call upon me and come and pray to me, and I will hear you. You will seek me and find me, when you seek me with all your heart. I will be found by you, declares the Lord, and I will restore your fortunes and gather you from all the nations and all the places where I have driven you, declares the Lord, and I will bring you back to the place from which I sent you into exile." It was like a cool, refreshing breeze wrapped around my hurry, scurry heart, and the course of my day changed. It was still filled with crazy. Melt downs from a certain somebody that I wouldn't have been able to handle if I'd skipped that "meal." It was full of unexpected, tears, (some mine) problems to solve, and too much to do in the hours I had. Somehow, when I stretched out and closed my eyes last night, it wasn't so bad. I had been sustained. I didn't know what my day was to hold when I awoke that morning but God did, and He knew I would need to feast on His strength in order to get through it. (And in truth, don't we always need that?) I don't always heed His whispers to stop and be with Him in the midst of chaos... but it's like the feeling after a great workout. You sure feel glad you spent the time after because it changes your whole day. Wish I didn't ever forget that part. I have to say this too, because girlfriend, if you're reading this and feeling frustrated because you can't escape the madness in your schedule to bask in His presence, this isn't really about how much time you spend. And let me just assure you, that I get it. When I was a younger mama with two little ones in diapers, I was lucky to squeeze in five minutes of uninterrupted thought! And oh the guilt I felt, knowing I "should" take more time on a consistent basis. If that's at all where you find yourself because you work full time, or your schedule is nuts or you have babies that demand your constant attention, I just want to encourage you. Kids grow, schedules change, routines vary and some days are more streamlined than others for all of us. I truly believe looking back a bit, that God was right there beside me, feeding me morsels of Himself to carry me as I dragged my sleep-deprived self through some exhausting days of being touched by needy, small hands all day. Sometimes it was as simple as His words in a song on the radio as I drove across town with sticky-fingered little ones buckled into car seats on our way to Target. Don't you love that? He will care for us because we are all his lambs. The cookies that restored my faith in...well, cookies. It's taken me five tries to begin this post for some reason. It was one of those jam-packed weekends and every time I sit down, something happens and I have to step away, then I lose my train of thought. Or someone loses a wooden arrow over the fence and needs me to let them back inside because the door locked behind them as they went next door to get it. Twice. Or someone comes and lays down on the guest bed to hang out while I type. This is blogging in real life, folks. And if this post makes absolutely no sense, at least I had an excuse right? Ah motherhood at it's finest. We wouldn't want it any other way, would we? I'm basically here to talk about a cookie, but I wish we could chat about Downton Abbey and how my heart is breaking for Anna. Just as a side note. Since my mind is going eleventy-hundred directions at once right now. There was a point a few years ago, after finding out that my daughter and I couldn't ingest gluten anymore, where I went through my tried and true recipes and threw most of them out. Realizing that we could no longer make certain items, or convert them (deliciously) into gluten free options kind of bummed us out. There were a few recipes that were so amazing I kept them in the back of my recipe binder. One in particular, was a recipe for sugar cookies. What makes them special is the almond flavoring.. and the use of powdered sugar, rather than regular sugar. It's the kind of cookie that bakes with a slight crunch on the outer layer but has a tender texture inside. Topped with fluffy icing, this cookie seems like a treat you'd pay for at a coffee stand. It is a fact that I have even become friends with perfect strangers over this particular recipe. The title at the top of my recipe card reads, "The Best Sugar cookies EVER." They were that good. Sadly they didn't convert easily into gluten free cookies, and my experience with gluten free sugar cookies have been a bit disappointing with the exception of this vanilla bean sugar cookie recipe. Probably because I was comparing them all to the BEST SUGAR COOKIES EVER. Ya know? Anyway, fast forward to a few months ago when my man did some Costco shopping for us and brought home a surprise bag of gluten free cup for cup flour. It is the Namaste brand. I know it's at Costco right now and that it's a blend that is supposed to replace flour in any recipe cup-for-cup but I threw the bag away when I decanted my flour into a canister, so I can't give you any more specifics. (Please don't throw rotten tomatoes at my head. Thanks.) I used that flour throughout the holidays and it was great. So... I decided I'd give these sugar cookies another try using what I had on hand. It worked!! I added 1/2 tsp xanthan gum for a binder because nobody likes too many crumbles in their cookie and those of us who attempt gf baking know all about that. I prepared myself that they would not taste exactly like the regular version, but they were as close as I've ever gotten, and they weren't a pain in the neck to handle with the rolling out and cutting process which is a first! I was so happy with them that we made a batch for the Seahawks game. I had seen some fun decorative candies at JoAnn's last week (lips, googly eyes, smiley teeth, moustaches, and some other colorful sprinkles. My kids flipped out decorating their little blue monster faces. Apparently this sort of activity is very fun for the tween crowd. I'll have to keep that in mind for the future. I gotta be honest, eating something with eyes is freaky. Anyway, the sugar hit the bloodstream immediately and we cheered the Seahawks on as they made it to the superbowl. Speaking of photos, I've been primarily using my 50mm lens again. I think I was in a photo-taking slump with a phone camera in my hand more than my Canon. It's been so long since I used my 50, that I'm almost having to relearn how to use a fixed lens, rather than a zoom lens- I forgot how much fun it is to shoot with!! Kind of breathed new life into my lack of desire to photograph things, which is just in time for my shop reopening. I am shooting for February 5th so stay tuned... it's getting crazy over here!! *Mix sugar and butter then add egg, vanilla and almond. Add dry ingredients and mix until combined. Refrigerate in discs for 2-3 hrs. Lay out disc onto parchment and place another piece of parchment over top, then roll out to about 1/4 thickness or slightly thinner. 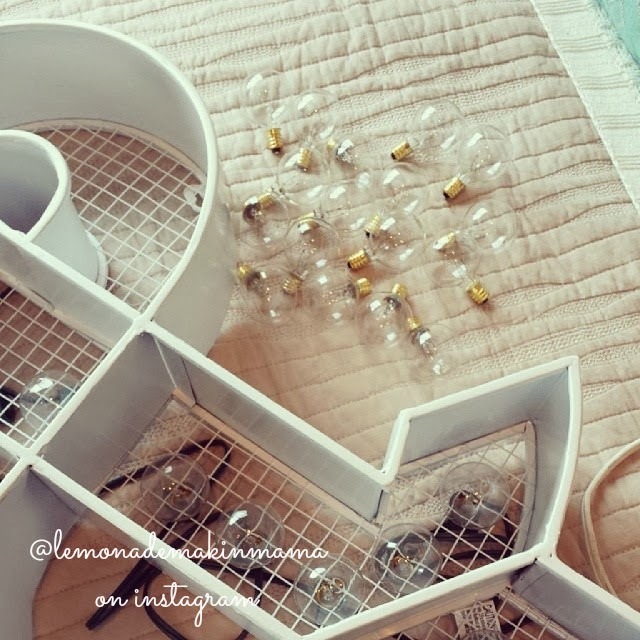 Cut into desired shapes and place on lined baking sheet. Bake at 375 for 7-8 minutes. And now I need to get the hoodlums lunches packed for tomorrow and move the laundry off my table so we can eat dinner. I've got a busy week of restocking flour sack dishtowels for the shop ahead of me. (I'm doing the Eat drink & be merry design in a couple fun colors for the everyday...along with the butcher chart cow and blue mason jar towels) It's going to be a good week I can tell. What's on your agenda for the rest of this week? Okay we all know that moment. The moment that comes after you have carefully stepped one toe gingerly outside the comfort and safety of the box you'd rather stay in... and set it down on unknown ground. It makes your stomach clench. It takes your appetite away. It might cause a few sleep-resistant nights but you push forward because you know in your heart it's going to make you stronger. You look backward before taking that first big step and that box... it beckons just a bit. It's safe and warm and known. It's maybe a little cramped in there, but you tell yourself that a person can get used to anything. If you leave that protective little shelter, who knows what could knock you sideways. Or go wrong. Oh that box... it's so very predictable. And let's be clear, we like predictable. When the doctor raises his eyebrow as he faces you in his office and begins to explain your prognosis, you want predictable. When your child's school calls in the middle of the day and there is bad news, you'd give anything for predictable. When you spouse says, "We need to talk tonight. I've got something I need to confess to you...." predictable would be a comfort. Unpredictable seems like it's always going to be bad, doesn't it? The great unknown. The spontaneous "who knows." I know people that have built a very predictable, safe, known world around themselves. It's a nice life, don't get me wrong, but they don't seem to let anyone in or out. Sometimes I wonder if it ever gets lonely, that being locked up in predictability. Because you know something? Come close and read this next part carefully. Safe predictability does not exist. It really doesn't. We tell ourselves that it does. We lock our doors and we drive safely and we keep laws of God and man but that's all a bit of an illusion because a hurricane doesn't care if your door is locked. A fire doesn't worry about what laws you never broke. Cancer doesn't think twice and relationships take turns without warning. Boxing ourselves in and making our world as safe and small as we can, do not qualify as living. Real living is breathing in and out and facing every unexpected thing that comes with the assurance that we are not all there is because the unexpected will come. It is, in fact, crouching at your doorstep waiting for the right moment. We fear it so much, but do you want to know something I've been learning over the past few years as I bumble my way though "work-in-progress-ville?" Endings are always beginnings. Always. We throw ourselves over the bed and cry and wail at the heavens because life took a dip on us when we weren't looking and God looks down tenderly and whispers, "Hush little one. I know you don't understand and I know it makes no sense but I have good plans for you. Even the ones that come from pain are for you. Never against you. They make you what you need to become and they shape your heart so it takes after mine, as long as you don't let bitterness and anger harden it first." And as I continue to walk this path alongside you, I know this truth. This moment of bravery in faith, and trusting that His plan is going to be awesome in the end, is where hope is born. It's the place that hope breathes and blinks it's first few moments in a heart born anew. He has a mighty plan. It's not always safe, or predictable or known... but it's always for us because in His eyes we are known. We must be brave in our faith in HIM and step out of that box to live the life He has planned for us. And it's going to be awesome. I am tentatively planning on a shop opening of Feb 5th at this point. The watercolor in this post will be available for purchase as soon as my shop opens, along with many other new prints. I'm laughing as I write this because I've been in a New Year's search out my heart phase lately, and this post has nothing to do with any of that. Sometimes life is heavy... and sometimes it's light and today is one of the latter. It's all about balance. I feel like we haven't chatted like old friends lately and I'm here to remedy that so grab a cup of something and let's talk. I was going to ask you all about random silly things I do and see if anyone else does them too (such as sucking in your stomach momentarily, every time I see a photograph sharing how to get amazing abs) but then I couldn't remember any other random things I do when I sat down to list them. If I wasn't sitting here trying to think about them, I'd come up with ten. Can you relate? I bought an electric teapot from Target to replace a teapot that was accidentally ruined by a small person who shall remain nameless. I didn't even know you could ruin a teapot. Whatever. I'd had my eye on this one for a year and I love it. Now if you pop in for a spot of tea I'll be ready. I also bought daffodils at Trader Joes because January is depressing and the rainy season is here (is it ever truly gone?) and they have cheered me immensely. Now, I want to chat about paint and such. We are gearing up to paint our ceiling soon. (Chewing on rocks sounds just about as fun, wouldn't you agree?) I recently made the decision to take down the pot rack that has hung over my island for the last decade and maybe you have have noticed it's absence by now. It was big and heavy and dark and I wanted to open things up a bit. Also my cooking pots, once new and shiny, weren't exactly things I wanted to display any longer, after ten years of use. Savvy? I gave it to my sis in law and she was thrilled. The options are limitless. We could leave it as is. Open, airy and light or we could do something with a light fixture in that space. Time will tell but for now I am loving it open. We're still chewing on paint discussions, as this spring will herald an exterior paint job that we've been putting off the past couple of years, and the dreaded ceiling paint job that has been needing to be done for several years, after a couple of summers with minor construction, kitchen renovations, etc. We ignored the ceiling but it's time to deal with it. We're discussing whether or not to paint the walls with a fresh coat as well... as they kind of need it too, thanks to the general knocks and bangs of kids and life. We're trying to decide if the ceiling and walls should match in color so we don't have to do any "cutting in" at the corners... and color of course, is taking most of my thoughts. Adrain and I disagree but I trust him implicitly as he advises architects and designers and many other people on color choices for a living, and he has always chosen every color we have used in the past. The man knows his color. For the interior I want white (yet I still want to see my trim stand out just a bit.) My man said white is impractical. Okay what he really said was, "Really?! Why.....?" and then left it hanging there for a while. (I read between the lines on that one.) Then he gave me the list of the most popular designer colors right now including a run down on Pottery Barn's line. I looked up his recommendations and we're debating. He will win. He always does. Because he's always right. (About this, anyway.) I will keep showing him pins with the "looks I like" and he will eventually say, "Okay here is the color you want then, to get that look." And then we'll finally paint and I will love it, as I always do. And I'll keep you posted on that. As I close, I must share this moment with you because laughter is such good medicine. I was sitting in the car waiting to pick up Joe from a weekend youth retreat. 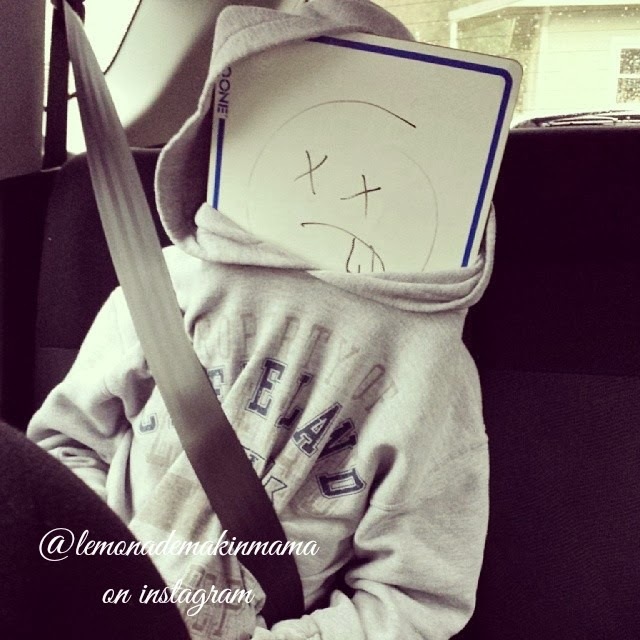 I turned around and Ava was sitting in the backseat with a whiteboard for a face. I laughed out loud for a full two minutes. Maybe more. Then I instagrammed it. Oh this child. She's a funny one. So... now that I've done all the talking today... what do you think about all of that? Hi Friends! I'm trying to find my post-holiday, post-wedding in my home, post-sick kiddos, post-hubby on vacation from work groove again. It's a process, is it not? In the mean-time I thought I'd share some post-holiday house fluffing with you...(Can you even call it that when everything is so bare and sad-looking?) And then when you least expect it...I will vomit out what's on my heart toward the bottom of this post. Er. Now you're expecting it. Well I haven't gotten my groove back yet so what can I say? This ampersand was a gift from Nurse Nicki. And as she gave it to me here's what she said. "Yeah, it just screamed SASHA at me." "OH and feel free to paint it or whatever you want to do with it. I know it won't stay the same." Do you love a friend who "gets" you? Might be the best present I've ever gotten. I hugged it and carried it around with me for a while. Then I added a string of cafe lights through the grill on the back and made it into a marquee light. And then I moved it around all over the house until it found it's new home. Then I fell madly in love with it all over again. It makes up for the lack of holiday cheer and decor. Please ignore the spackle patches on the walls. We are gearing up for a ceiling paint job (shudder) and figured we might as well give everything a fresh coat at once. I just haven't decided on a slightly less yellow shade of creamy paint to go with... or keep the same thing. It'll come to me. This typewriter is the inspiration for my shop re-opening next month. I'm having so much fun with it! Anyway, I was curious what you do when you know you should do something in life, but it terrifies you to the core. You know in your bones that it's the right thing, the best thing, the thing that will change you and forever leave a stamp on you for the better... but your mouth goes dry just thinking about it and you suddenly want your mommy. I'm mentally sucking the optimism out of this verse; Isaiah 41:13 "For I am the LORD, your God, who takes hold of your right hand and says to you, Do not fear; I will help you." I love it even more now. Probably because Mr. Optimism (aka Adrain) always tells me things like that too. He says things like, "Everything is going to be fine. Don't panic. I'm here and it's all going to be okay." And you know what? It always is. In twenty years with the man, it's never not been okay. I think my glass of courage is half full already. How about you? 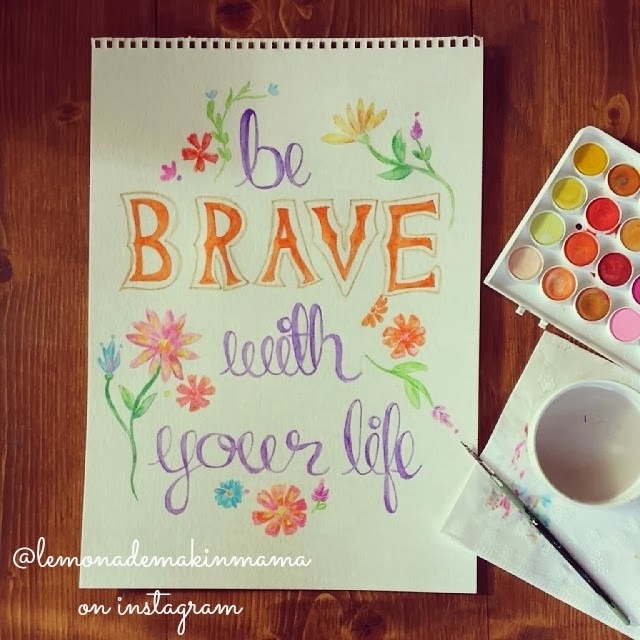 Anything scary that you're working up the courage to do?